Dispatchers won't admit this, but they are neither perfect nor omnipotent. Further, most of them are not as good as engineers at covering their mistakes...but we digress. Rule 220. Train orders once in effect continue so until fulfilled, superseded, annulled, or become void. Any part of a movement may be either superseded, annulled or become void. Once a TO's instructions - say, for two trains to meet - are completed the order has been fulfilled, and is no longer in effect. If crews receive a Form P train order to meet at Cat, instead of at Dog, as proscribed by a previous order, the original order has been superceded and is no longer in effect. A Form L order stating "ORDER NO 67 IS ANNULLED" certainly means that it is no longer in effect. When a work extra's Form H authority stipulates that it may work until 5:59PM, the crew's authority is void at 600PM, because the order is no longer in effect. Timetable schedules can be changed in the same manner as train orders. We've already seen this in the case of a column wait superseding the late-running #99's timetable schedule. If #99 was running more than 12 hours late, by the way, it's timetable authority would be void, and it would be advancing under Form G authority as an extra train. All of these principles still apply to today's track warrants and Direct Traffic Control, but nobody (other than dispatchers) talks about them much anymore. Modern systems of moving trains leave almost all of the head work to the dispatcher. Below is an example of an order that has been annulled using a Form L. Somebody apparently got his wires crossed in the original order. The original order is a Form F, which is used to authorize following sections of a regular train. 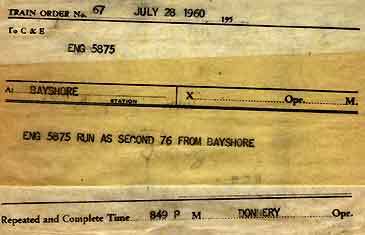 In this case, First 76 is the Lark, and Second 76 is a freight (or light engine; caboose hop) out of Bayshore Yard. 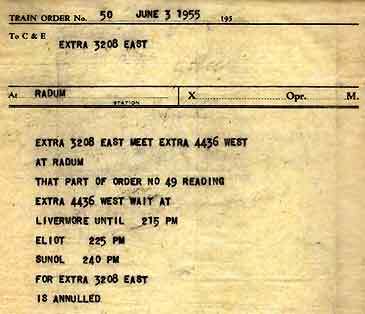 If the game plan changes, the rules allow for part of an order to be changed using a Form M. At right, the column wait portion of an order has been annuled and a fixed meeting point established. Once the 3208 and the 4436 meet at Radum, Order #50 is fulfilled and is no longer in effect. One other type of anulling order is the Form K, which annulls a timetable schedule, or a section of a regular train.